What you see here is a referee being struck in the face during a fight at a high school game in Ohio between Springfield and Shelbyville Kettering Fairmont on Friday. The official was taken to the hospital with a facial injury but will be OK. 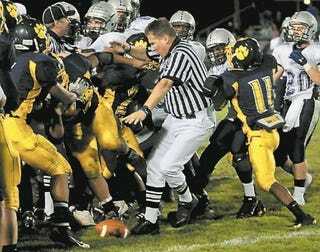 In case you've never seen one in person, there's no scarier scenario in sports than a benches-clearing football fight. Ned can attest to that. An emotional football game, won 15-8 by the Firebirds, turned ugly when a bench-clearing brawl erupted with 2:50 remaining in the first half. Wildcats linebacker Austin Moore intercepted a Marc Pedro pass and was tackled around the 50. Then pandemonium broke loose. The play ended near the Springfield sideline. Several Springfield players came onto the field when some players didn't stop with the whistle. Then several Fairmont players ran across the field to form a mess of blue and white jerseys. After it was over, two referees needed medical attention from school athletic trainers. Springfield linebacker Trey DePriest was ejected, and another Springfield player was removed by school officials.